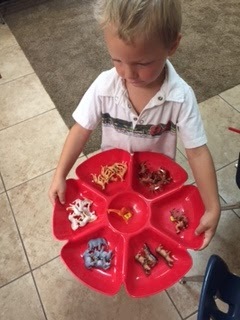 My little guy in Preschool this year. This pose is funny. The thing is, I didn't believe it was the right business for me as an individual or sole proprietor. And I really wanted to focus on something that I can do right now and not just dream about for years to come. And, several people and close friends, have suggested and prodded me toward doing preschool in my home. But it didn't hit me square between the eyes, until it hit me square between the eyes, that hey, I could do this. So, I have saught out the how to and followed the red tape, crossed my t's and dotted my i's. The name of my preschool will be Kids at Play Preschool. I will start out with 4 students to keep it easy and more one on one attention, very personal while figuring out this first year of curriculum. We will be cooking and crafting every week though, and I can guarantee fun! Without further ado, I will now provide a list of competition. But seeing as how some are located out in other areas were other people live, I don't really consider it competition as much as a choice! Also, some of these preschools did not present at the Free2Feed event, they are just other ones that I know about. Little Lions Preschool. This school is ran in the home of Brittany, a mother of two and former elementary school teacher in this district. She has been teaching preschool for four years. Her programs runs twice a week: Monday and Wednesday for 2.5 hours and costs $85 per month. Her school is located in Washington City, Utah north of the I-15 in the Green Springs area. Her website is www.lil-lions.com She presented at the Free2Feed event and if I recall correctly, she had 8 students in her group. And here was an interested tidbit, they were all boys this last year. I bet she is hoping to get some more girls next semester! At the time of the event, she still had open space available for the 2017/2018 school year. ABC Academy. This school is ran by Sarah Kerr. I heard about it through word of mouth. She originally started out doing preschool in her home and upgraded to using a dance facility. Actually, a little girl I babysat last school year went here so I often dropped or picked her up. And I was impressed by how close it was to my house 😁 and just the professionalism but still friendliness. The registration for the 2017/2018 school year is as far as I know full. But it was so popular that she added a second class in the afternoon and that's how I got in. I was crossing my fingers and so thankful! It's a full three hour block! I feel like I can actually get something done before pick up which is so valuable to me as a part time crafter/painter 😊 The days are two days a week Tuesday and Thursdays or three days a week Tuesday, Wednesday and Thursday. It was usually just mornings but now it's also afternoons. It's possible you could still get placement in that afternoon class! Here is the website: www.abcacademysg.com So, you can see from the website that the afternoon class isn't listed but I am telling you there is one. So call Sarah and see if you can get in for the 2017-2018 school year. Good luck! 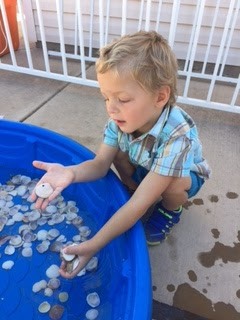 Last day of preschool, outside water fun.